Developing your team’s leadership and team capability is critical for the success of your organisation. Imagine what your team could achieve if they were all working together collaboratively, and they all shared your vision and values. Your organisation would be far more productive, and your team would be engaged and empowered like never before. Our objective is to transform your team to a high performing level. We accompany your team on a journey and tailor a program to meet your objectives. We stimulate, challenge and facilitate using our experiential based Team Building, Team Development and Leadership programs. This may be from a half day to 6 months with a view to an ongoing and sustainable improvement. By assembling elite operators with backgrounds in psychology, sport and the military but with senior corporate experience, we’ve achieved a balance of applied research, military planning and business leadership expertise. Many of our team are former SPECIAL FORCES operatives who understand how teams work in the most compelling environments imaginable. They have a wealth of practical expertise backed up with by our 360 organisational surveys and leadership protocol reporting. Extortionists have demanded a $10 million ransom within a four hour deadline, or your company’s plans for a new range of products will be destroyed. Working in a team environment with the help of our Amazing Race style app on their smartphones, the mission begins. They must earn as much money to pay a ransom in time by solving clues and going from checkpoint to checkpoint. Not only will they enjoy a great event it helps bond the team which will be remembered for a considerable time to come. Plans to unveil your company’s newest project are left in tatters as armed terrorists steal your plans in a dramatic raid. Your mission: complete a series of team designed tasks and defuse the Bomb. 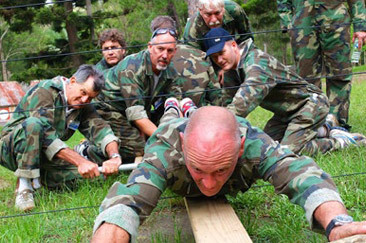 Your group will cross the Electric Fence, recover a Nuclear contaminated container, build the Bridge and construct a Raft amongst many other challenges, whilst being coached by elite former SPECIAL AIR SERVICE operatives. It’s a race against time to defuse the bomb but which wires do the team cut to avoid detonation? The Helping Hands Project is a truly unique opportunity for organisations to get involved with a worthwhile cause at the same time as super-charging employee engagement. 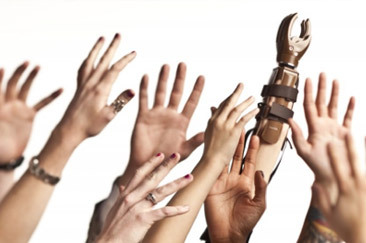 More than just team building, participants in our programs build prosthetic hands that are then donated to amputee land-mine victims throughout the developing world. The activity empowers every participant in just a few hours to make a real and lasting contribution, and in doing so reminds people what it feels like to be engaged in a truly purposeful activity.